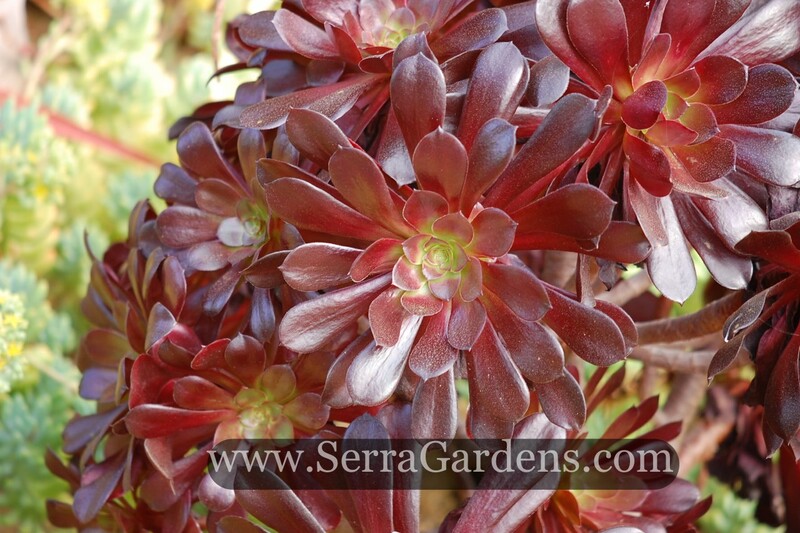 Over time, Aeonium Garnet will become a multi-branched low shrub-like succulent of multiple dense rosettes. In bright light the rosettes are deep bronze burgundy on their edges with some green in the center. Remove spent flower spikes as desired. This plant works well in containers, alone, or combined with other succulents. It is also at home in succulent garden borders and in xeriscape and rock gardens. The deep bronze-burgundy rosettes centered with green create visual interest wherever it is located. Its color and form make it a nice companion to drought tolerant grasses as well. Aeonium 'Garnet' is can be propagated by stem cuttings. Root rot in poor draining soils. Snails are may eat young leaves. Over time this aeonium will become a multi-branched low shrub-like succulent of multiple dense rosettes. In bright light the rosettes are deep bronze burgundy on their edges with some green in the center. In lower light levels the entire plant will be green. In spring the plant blooms, sending up conical clusters of small bright yellow flowers of typical crassulaceae structure. Flowering taxes the plant and blooming stems may die back. This is a hybrid Aeonium created by Jack Catlin by crossing A. 'Schwarzkopf and A. tabuliforme. Three plants emerged from the cross, with one not being able to survive. The remaining sister plant being named aeonium ‘zwartkin’ is similar to ‘garnet’ with a slightly different leaf structure and color. ‘Garnet’ shows the low growing nature of tabuliforme while having the deep color of ‘zwartkopf’.